An elephant forced to work at a religious temple in India was beaten so badly by her caretaker that she was left blind. 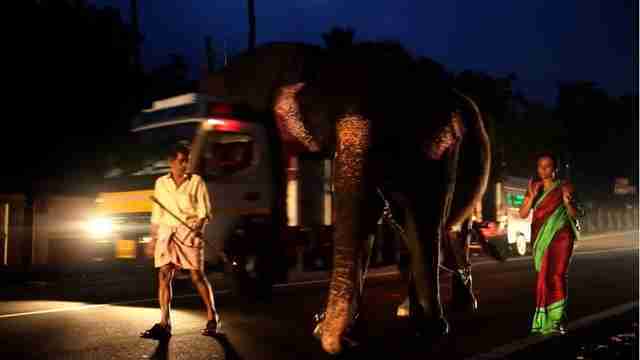 It is the kind of cruelty that befalls hundreds of temple elephants in southern India, says Sangita Iyer, the filmmaker behind "Gods in Shackles," a forthcoming documentary about their plight. 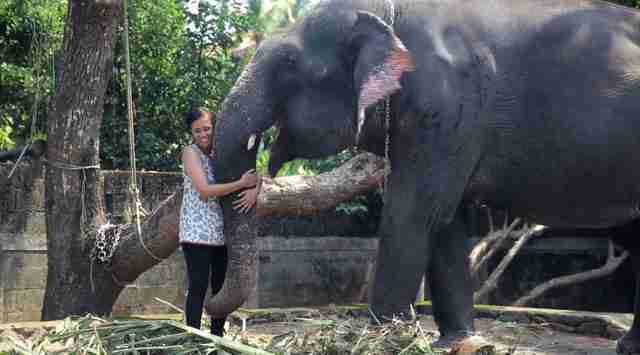 Iyer says she met Lakshmi, the abused elephant, in 2013 at the Thiruvambady Temple in the state of Kerala, and says she "stole her heart." 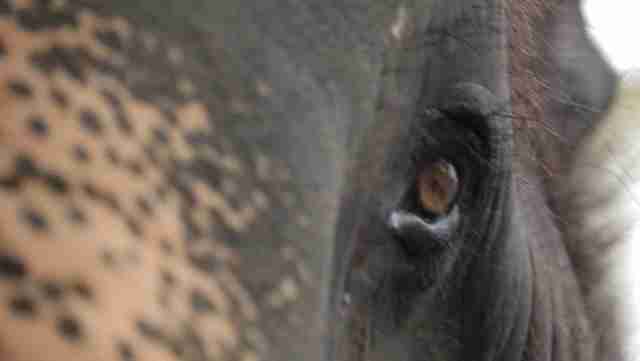 A photograph of Lakshmi in 2014 shows "her gorgeous brown honey eye," wrote Iyer, in the Huffington Post. But in a return visit this summer, the situation was vastly different. "When I returned to Kerala in June 2015 I heard troubling rumors," Iyer tells The Dodo. "So I went to check up on her. I was devastated to see what I saw." Iyer says Lakshmi's left eye was swollen shut and when she tried to open her eye, "I could see a white scar on her eyeball." "I found out that one day at the temple, Lakshmi had eaten her mahout's [caretaker's] vegetables that he'd left unattended," she says. So, in a fit of rage, the man beat her "mercilessly." A veterinarian, whom Iyer says she never saw over the course of her five-day visit, claimed that Lakshmi simply had an eye infection. "It's a veterinarian's job to pour eye drops, but he never showed up," Iyer says. 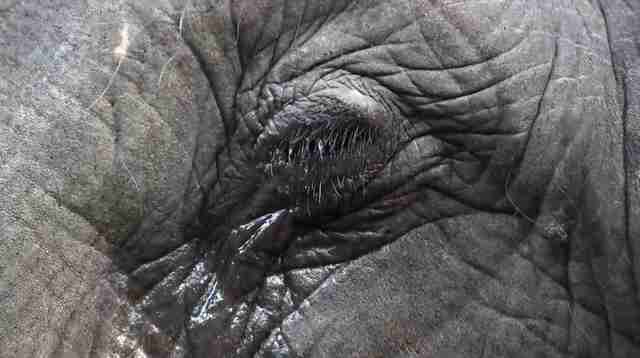 Rather, the mahouts - "with their filthy hands and nails caked with dirt ... brutally forced their fingers into [Lakshmi's] eye." Lakshmi, lying on the floor, was resisting, and keeping her eyelids "tightly closed." The mahouts kept trying. Lakshmi kept resisting. The cycle, says Iyer, lasted 20 minutes. Eventually, the mahouts popped out Lakshmi's eyeball and put in the drops (Iyer explains the eye went back in). "I don't know how I managed to keep the camera steady during the entire ordeal," Iyer says. The Animal Welfare Board of India launched an investigation into Lakshmi's condition, Iyer says - "in a nutshell [it wrote] that Lakshmi is likely permanently blind." The mahout was fired and has been replaced. Iyer says she hopes that the new mahout is treating Lakshmi well. This is just another brutal strand in Lakshmi's life. According to Iyer, the approximately 50-year-old elephant starts her day at 4 a.m. "Her first morning [religious] ritual is at 7:30 a.m. The next one at 9:30. Then she gets a rest at noon. The next half of her day begins at 4 p.m. [with] one evening ritual that starts at 7:30 p.m. [Then] she returns home by 8:30 p.m."
And this whole time, she is in shackles. 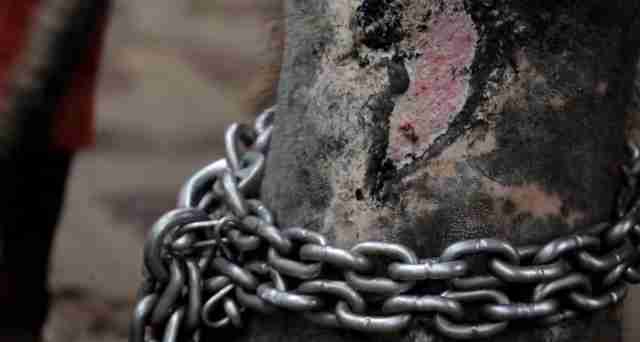 For 22 hours a day, Iyer says, Lakshmi's right rear leg and left front leg are shackled to two iron poles "or her two legs are shackled whilst at the temple. When she walks, her one leg is shackled." Iyer hopes her film will encourage seismic public and policy shifts about captive temple elephants: "Most people, no matter how well intentioned, have a lot of misperceptions about them. They feel elephants don't feel pain because they have thick skin, they feel elephants can bear any amount of burden on their back because they are gigantic and in fact they don't even realize that elephants feel emotions." "'Gods In Shackles,'" Iyer says, "not only exposes the atrocities but also focuses on these basic scientific facts about elephants." She hopes it will encourage people to realize "that it's not OK to abuse these sensitive animals under the guise of culture and religion." 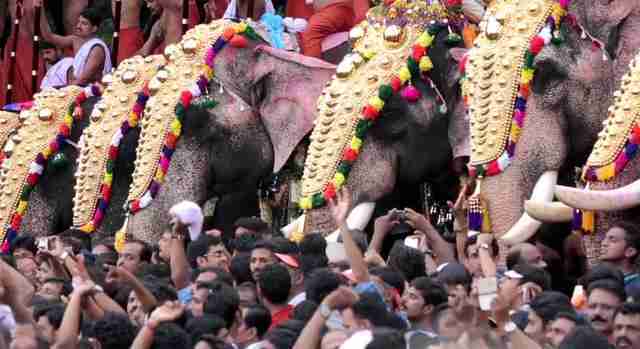 In the meantime, India's supreme court is debating whether or not the riding of captive elephants in India should be allowed, which could impact the future of temple elephants. To watch a trailer of "Gods in Shackles," go here.